As far as possible we mimic natural systems and processes, whilst achieving a healthy crop. For this purpose we are developing a range of “tools” which fit the UK climate. Although listed below as different tools, they are all part of a holistic approach. They are tweaks and adjustments for individual situations. It is important to get a base of skills and understanding of these tools so the farmer and grower has autonomy and understanding to make their own preparations, empowering the farmer and reaching a broader scale. We are not selling products off the shelf, we are happier to run courses to explain the principles. For instance biofertiliser, an anaerobic ferment is good for chelating minerals so they are more available to plants. However aerobic tea, made by bubbling air through microbes in solution, is great for building more biology into the system. Native microbes can be propagated aerobically like this, or through the Native Microbe preparation outlined below. 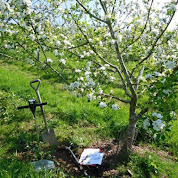 Lastly, we can measure the integration of these techniques and their effect on soil structure using Chromatography.